Mike had asked his firm for executive coaching so that he could learn to delegate better. As a partner, he was successful at bringing in business and maintaining a high level of performance, but associates complained that he was not bringing them along and that they were underutilized, while Mike complained that he was overwhelmed and occasionally on the verge of burnout. Life in a law firm is always pressured. Time is a precious commodity. If a lawyer can free up more time for herself by delegating appropriate tasks to support staff and associates, she can really benefit. Delegation frees up time for a senior lawyer to do those tasks requiring greater expertise and judgment, as well as time to originate business. Even more important, delegation can create breathing room: time for family, friends, and self. Recreation is about recreating a sense of purpose, commitment, and personal connectedness so that burnout does not interfere with productivity. Of course recreation is also about fun, and fun shouldn’t be a dirty word. Let’s face it, delegating is like a much needed pressure valve on an overloaded dam. If you turn the valve, you can get relief. Not everyone has an easy time turning the valve. 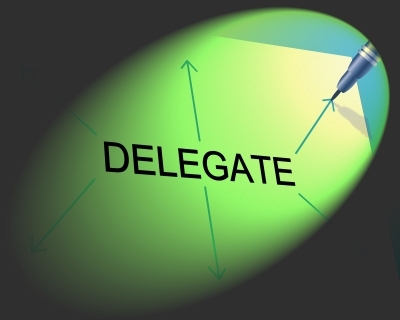 People have trouble delegating to others for a variety of reasons. Mike and I needed to figure out why he was having his particular difficulty and how to create a strategy to solve his problem. “Let’s say you have too much work to do on a particular case and you are thinking about giving some pieces of the project to an associate or two. What happens? How do you think about it?” I asked. What was funny and painful about Mike’s situation was that he understood it so well, but was still unable to help himself by asking for help from others much earlier. What also came out was that he seemed to be running into trouble by waiting too long to assign work because he believed he was the best guy for every job. In addition, Mike was trying to be a “good guy” by protecting associates from his lack of foresight and advanced planning. The result was that Mike had turned into the equivalent of the little red hen who took on too much, got mad about it, blamed himself, and turned into a martyr. Clearly Mike needed to think and act differently about assigning work. Since he played football in high school, that seemed like a good place for us to start to rework his faulty management approach. I asked him to pretend that he was the star quarterback on the legal team doing the work on his cases. His associates and other support staff were the other players on the team. “Can you imagine what would happen to the team if the quarterback ran all the plays?” Mike got it, of course, and we worked with the analogy some more. If the quarterback ran all the plays, the other members of the team would never get better at their jobs. If the quarterback didn’t hand off the ball until it was too late, the other team members would be at a disadvantage trying to complete the plays. Besides, the quarterback would probably get exhausted and burn out. I asked Mike to change his approach to management by writing down a daily “to do” list in the evening before leaving work. The list would identify everything he needed to tackle the next day. He could do the same sort of list of “plays” for each open case. Next, he would go back over these lists and identify every single task that he could hand off to an appropriate associate or support person, putting the player’s name by the item. His job was to complete the hand off right away, telling, emailing, or writing the associate what he expected done, when he needed the task completed, and recording the date of expected completion on his “to do” list. The good news? Football legal management has worked great for Mike. Could it work for you too? Is “Do What You Love” Good Advice? How often have you heard this advice? It can be an exciting invitation to leave your boring job behind and try something adventurous, daring, and new. There are stories about people who did follow their dreams who landed on their feet. But there are also stories about people who tried to do that and ended up bankrupt or in a bad situation: the actress-to-be who moved to Hollywood, could not get any jobs in the film industry, and ended up waiting tables; the would-be blockbuster author who left the practice of law but did not become the next Scott Turow. One size does not fit all. Good advice for one person is not necessarily good advice for everyone. When people give the advice – follow your dream – what they are often encouraging is an entrepreneurial aspiration and a break from traditional work life: the creation of a whole new line of fashion footwear or candle scents or brownies or a new app that will change the world. And sometimes that advice is given by people who are themselves tired of the routine nature of their own lives, and give advice to others that they wish they could follow themselves. The decision to leave your current career path for something that has a low probability of success is something that needs to be thought through very carefully. Sometimes it is the right career move. Sometimes it is not. What goes into a thoughtful career decision about actually following your dream is a mixture of many elements, including how you will manage risk. The ability to manage risk is both financial and emotional. It includes whether you have enough money in reserve to support yourself if the venture is not an instant success. You want to make a thoughtful assessment of the current economic situation in the world at large and how hungry it might be for your new idea or venture. And there are personality traits that will make a difference in your success. You want to think about your ability to follow through on tasks you give yourself and your ability to face problems and solve them as they arise, as well as your ability to take advantage of opportunities when you see them to push your agenda forward. Do you have responsibilities to your family that will cause you sleepless nights if your venture is not a success? Do you have a lot of debt? This combination of personality traits and economic forces will shape a venture and make it more or less likely that you will realize your dream if you do decide to follow it by taking action. Some people should follow their dream but others should not. However, even if taking action to follow your dream is not the best advice for you, daring to dream is always good advice. Daring to dream is different from acting on your dream. Daring to dream about what you want in your work life is always very valuable. When you imagine what you really want and need in your dream career, you can learn the building blocks you should have in your actual career. I ask my clients to imagine a job they would enjoy doing so that we can mine that “dream” for elements that will indicate the right career direction. I ask my clients to “fix” their current job so that we can see what is missing or making them particularly unhappy, and what they yearn to have in a career or a workplace. Once we talk in these terms, we gain a lot of information that is useful for career planning. Many of my clients imagine a work life where they have a job with a mission shared by other people they respect and who respect them as well. They imagine a collegial group of supportive people, doing work they are very interested in with the opportunity to be challenged and to become an expert, as well as mentoring others. When you dream or envision your career in this way, the specific dream you have that is uniquely your vision becomes very instructive. It guides and defines your aspirational career goal. Part of the process of dreaming is figuring out your strong interests as well. In fact most of the time I would not say “follow your dream,” but I would say “follow your strong interests.” And if you do not think you have any strong interests, you are probably someone who does have a strong interest, namely, an interest in having a life that allows you time for friends and family and outside activities. Strong interests are important because you want to like what you are thinking about for most of the waking hours of your life. That sounds obvious but I continue to be amazed by the number of people I work with who did not factor their strong interests into their career path choices. I counsel hundreds of unhappy lawyers who do not like thinking about the law. I counsel many new graduates who think they should go into finance or sales because their friends have done that, even though they personally have no interest or aptitude. Interest is a huge motivator. It inspires people to want to get up every day to go to work. Identify your interests and get creative about how to express them in your career. You will be more likely to enjoy your work life if you do. Not everyone has the ability or chance to follow their strong interests, but even something close or added in your off hours can help to enhance career satisfaction. If you cannot have a career as a musician or author, for example, you might enjoy working with creative people to help them be successful. If you cannot be a sports reporter, you might enjoy writing a blog about sports after hours. If you are a people person and you love making people feel welcome, you might not get to be the host of America’s Got Talent, but you do want to search for jobs where you can have the role of the person who welcomes and embraces others. Maybe that job would be in a restaurant, or perhaps it is in sales, or as part of a hospitality team doing installations and events. When you think about work in this way, mining your dream for the elements that bring you happiness, you can identify the right career path far better. The key is to dream first. Because buried in your dream are the elements of a work life that you will want to get up and do every day. And visit Sheila on Facebook and LinkedIn. 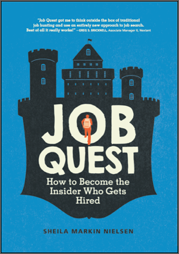 What Are the Most Effective Job Sites, and Are They Enough? What Can Trevor Noah Tell You About How To Find a Good Career Path? What Advice Would I Give my Younger Self? All contents copyright (C) 2015-2019 Nielsen Career Consulting Service. All Rights Reserved.